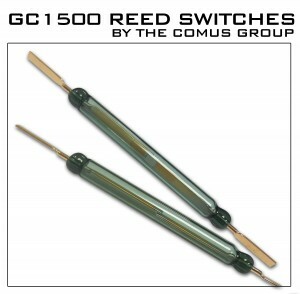 The Comus Group is proud to introduce the GC1500 Series of reed switch made by its Switching Technologies Gunther Division located in Chennai, India. The STG GC1500 Series offers a wide range of 1 Form A Rhodium contacts with ratings up to 120 Watt/VA loads, switching voltages up to 1500 VAC/VDC, and 3 Amp switching and 5 Amp carry currents. The GC1500 is RoHS Compliant and UL recognized E103299. The reed switch has gold tinned leads for ease of soldering and is available with cut and formed leads. Comus International was founded in June 1978 by our President and CEO, Robert P. Romano. Comus International started out as a manufacturer of glass mercury tilt-switches for residential and commercial thermostats. Immediate success and rapid growth led to new product development and soon the metal mercury switch and, ultimately, the patented non-mercury switch were designed and offered to the market. Comus International is commited to Customer service. We are always looking to enhance and improve our Customer Service, and we look to you, our customers, for feedback about how we are doing and what we can do to improve your experience doing business with us. If you have any suggestions, questions or complaints and would like us to follow up please call us directly at +1(973)777-6900 .